We fly connected planes and design self-driving cars, but what about smart trains? If you pay close attention, there is the faint sound of the whistle coming from around the digital bend. It’s about time. Bodnar’s train brain will help railways boost locomotive horsepower, improve operations and burn less fuel. “It’s really about enabling self-aware trains in a smart ecosystem,” he says. Even a small improvement in efficiency can make a big difference. In the age of consumption and climate change, this is important stuff. For starters, freight has big environmental benefits. On average, railroads are four times more fuel-efficient than trucks, according to the Association of American Railroads, and moving more freight to rails would cut down on traffic and pollution on highways. Consider that a single 12-cylinder GE Evolution Series locomotive can pull the equivalent of 170 Boeing 747 jetliners. The brain connects to GoLINC—an onboard software and computing platform that turns a locomotive into what is essentially a mobile data center. The system is already in more than 6,000 trains. GoLINC allows train operators to gather information from track sensors and cameras to better understand the flow of rail traffic and road conditions. It uses the data to make intelligent decisions, even while traveling through the Rockies or the Mojave Desert. But the system is just part of GE’s vision for the industry’s digital future. 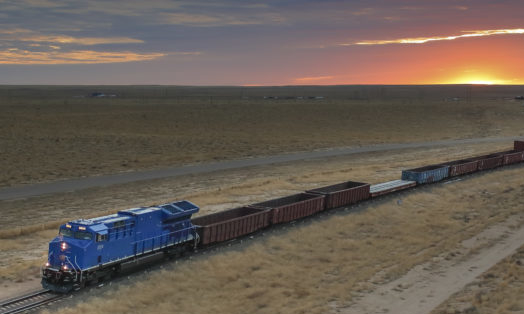 The company wants to connect all of its 21,000 locomotives, pulling freight and passengers in 50 countries, to Predix, its cloud-based software platform for the Industrial Internet. Right now the U.S. rail industry deals with 500,000 delays a year, and one in every four trains experiences some kind of unplanned downtime. By making trains smarter and connecting them to the Industrial Internet, freight companies can reduce this downtime. GoLINC, working with other Predix train apps such as Trip Optimizer and Yard Planner, can anticipate maintenance problems so operators can resolve them before they become a problem. They can see where lines are running efficiently and where routes need to be reworked. Even a small improvement in efficiency can make a big difference. A 1 percent reduction in wait times at stops can save $2.2 billion, GE says. A 1 mph rise in speed can save $2.5 billion.